As soon as Idrees got home from school, he ran to his grandfather to ask him about something that was on his mind. "Grandpa," he said, "I want to ask you something." "What is it, Idrees?" asked Grandpa Uthman. "Grandpa, on the bus, a lady was telling her friend how important patience is, and how true patience should be as it is described in the Qur'an. Can you tell me what that means, Grandpa?" Grandpa Uthman nodded: "Most people don't know what real patience is, or how a patient person should behave. Some people think that patience just means confronting the difficulties and frustrations of life and putting up with them. But Allah teaches us in the Qur'an that real patience is very different from just putting up with something." 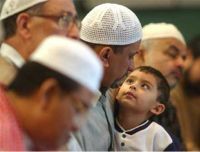 Idrees asked another question: "So, Grandpa, what's the source of this patience in the Qur'an?" "You know, Idrees," answered his grandfather, "that the way to gain Allah's favor, love and pleasure is to fully obey His laws and commands in the Qur'an. Allah wants His servants to practice the morality of the Qur'an fully until the end of their lives. And the secret that enables them to obey this command, come what may, lies in the perfect patience that comes from faith. A person who learns the real meaning of patience can behave in the way that Allah desires from him and be regular in performing his prayers. A person of faith knows that Allah's knowledge and wisdom is in everything, nothing happens without His permission and that, behind every event, lie the purpose and all the countless good things that He has created." "In that case, a person shouldn't be upset at the things that happen to him, but should always have patience," said Idrees. '[Believers are] those who are steadfast and put their trust in their Lord.' (Surat al-'Ankabut: 59)"
"In that case, a believer's patience can't wear out!" exclaimed Idrees excitedly. "Now I understand what the lady on the bus was saying." Grandpa Uthman answered: "Yes, my boy. Human beings show patience because it is a command from Allah, and so they will never be in a situation where they will lose it. Throughout their whole lives they will perform this act of worship with pleasure and eagerness." "Thanks Grandpa," said Idrees. "Now I understand that patience is very important, and, if Allah so wills it, a person's patience will never come to an end."